Henry VIII was a self-centered, psychopath, without conscience or remorse, who did exactly the right thing at the right time for the wrong reasons. Now a leading politician looks at the series of political killings carried out by arguably Britain's most ruthless and blood-soaked monarch to see if there was a coherent programme to the killings or if Henry VIII was simply abeast in human form. 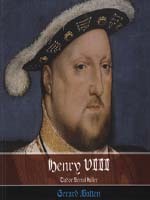 By studying the reasons for the judicial murders of figures such as Thomas More, Anny Boleyn, Thomas Cromwell and a host of other victims, this book seeks to show why it was that Henry indulged in show trials and summary executions in a way that neither his predecessors nor successors did.